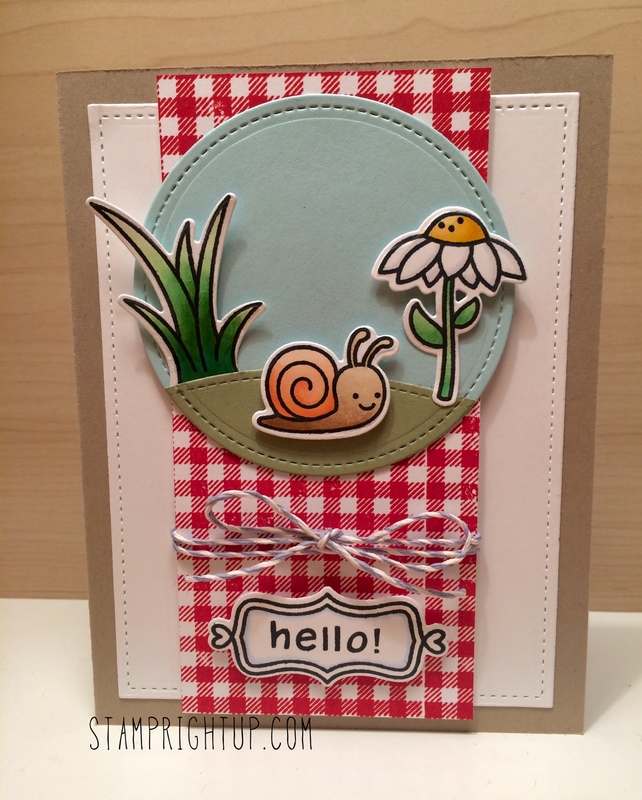 Lawn Fawn Gleeful Gardens with Spectrum Noir Markers | Stamp Right Up! The latest from the Lawn Fawn release, Gleeful Gardens goes so well with the new Gingham Backdrops stamp set. It took me a few tries to get the gingham to stamp in alignment all the way across, so I just fudged it and cut a strip of the best stamped part 😛 That worked out well in the long run as it inspired me to come up with this card. The snail is super cute and I love how the daisy flower just automatically inspires sunshiny feelings! All colored with Spectrum Noir markers this card took less than 20 minutes from start to finish to make – so I suspect I will be making a few more to keep on hand.